Dental caries remains an important public health problem with almost 30% of toddlers in the USA being affected by caries and 620 million children worldwide having untreated caries. The aim of this review was to assess the clinical efficacy of professionally applied fluoride therapy in remineralising and arresting dental caries for children. Searches were conducted in the Cochrane Library, PubMed, Embase and the ISI Web of Science. Clinical trials conducted in children and published in English where the outcome measures included the remineralisation or arresting effect of caries by professional fluoride treatment were considered. Two authors screed the studies and evaluated risk of bias independently. Random effect meta-analysis was undertaken. 17 RCT studies were included, 10 studies considered remineralisation and 7 studies arresting carious lesions. Arresting caries – 7 studies all involving silver diamine fluoride solution (SDF) or nano-silver fluoride solution in various concentrations 38%, 30% & 12%. 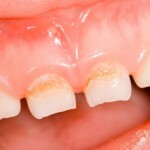 Professionally applied 5 % sodium fluoride varnish shows the capability to remineralise early enamel caries in children. Silver diamine fluoride solution at 38 % is effective in arresting active dentine caries. Because the number of clinical trials that studied the arresting effect of dental caries is limited, more clinical trials should be performed. Cochrane reviews have demonstrated the clinical effectiveness of topical fluoride agents, (Varnishes, Gels and toothpastes) in caries prevention. This review has looked specifically at remineralisation and arresting of existing carious lesions. While 4 major databases have been searched only English language studies have been included. While a range of topical fluoride agents were used a majority of the studies focused on two agents, fluoride varnish and silver diamine fluoride. These two agents demonstrated good effectiveness in remineralising and arresting carious lesions respectively. Gao SS, Zhang S, Mei ML, Lo EC, Chu CH. Caries remineralisation and arresting effect in children by professionally applied fluoride treatment – a systematic review. BMC Oral Health. 2016 Feb 1;16(1):12. doi: 10.1186/s12903-016-0171-6. PubMed PMID: 26831727; PubMed Central PMCID: PMC4736084. Dental Elf -12 Jan -2016 – Sealants or fluoride varnish for caries prevention?